Exalt 2: Give other friendly creatures in this lane +2/+2. Light of the Three is an epic Willpower creature card. It is part of the Houses of Morrowind expansion. "The Almsivi provide for all dunmer." 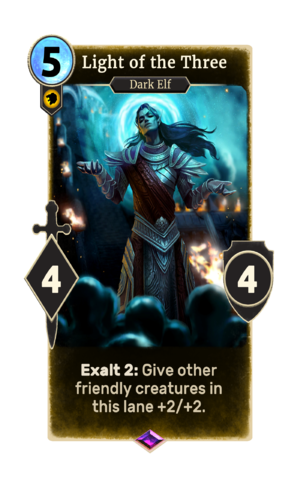 This card's exalt ability applies the Evangelized card effect. This page was last modified on 1 March 2019, at 23:45.